Cherry blossoms? What cherry blossoms? When I think back to our VISIONS Across America springtime trip to the Washington, D.C., area years from now, the thing I’ll remember most is that it snowed. And that – although we visited during Cherry Blossom Festival – there were no cherry blossoms. Not that it mattered. We were not there to see cherry blossoms. We were there to meet Iowa State alumni: 10 of them total, in Maryland, Pennsylvania, Delaware, Virginia, and D.C. itself. We started out in Washington, D.C., with a fast meeting with Thomas Hoenig (MS ’72 economics, PhD ’74). Tom has been vice chairman of the Federal Deposit Insurance Corporation (FDIC) since last April after serving with the Federal Reserve Bank in Kansas City, Mo., for 38 years. When I say “fast meeting,” I mean fast; he was on his way to catch a plane, so Jim took a few photos and I did a speed interview – and that was all the time we had with him. We headed north to Lancaster County, Pa., the home of our next two alumni. Located in the southeast portion of the state, the county is known for its “Pennsylvania Dutch” (actually, German) heritage and rolling Amish farmland. 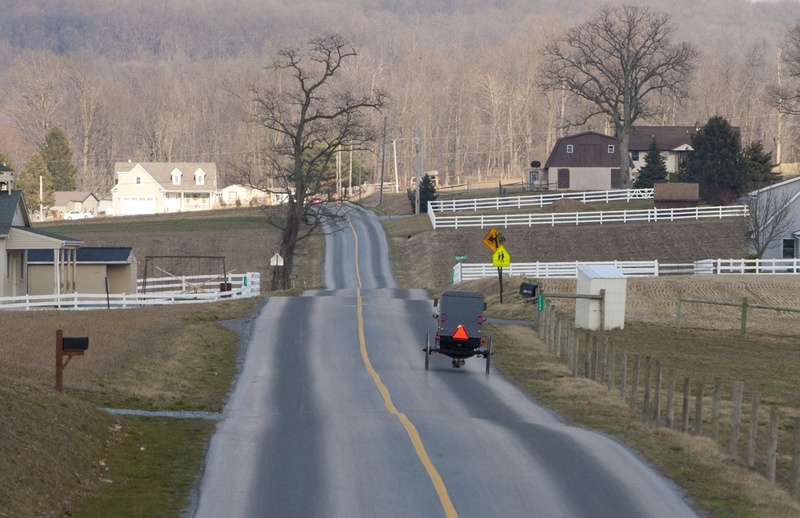 While we were there, Jim and I saw Amish farmers plowing fields with teams of horses and mules, families traveling by horse and buggy, and groups of Amish school children with their lunch pails heading to one-room schoolhouses. Bakeries abound, offering regional specialties like shoo-fly pie and individual black-and-white “whoopie pies.” We visited the Lancaster Central Market, America’s longest-running public farmers market, established in 1730. It was amazing. 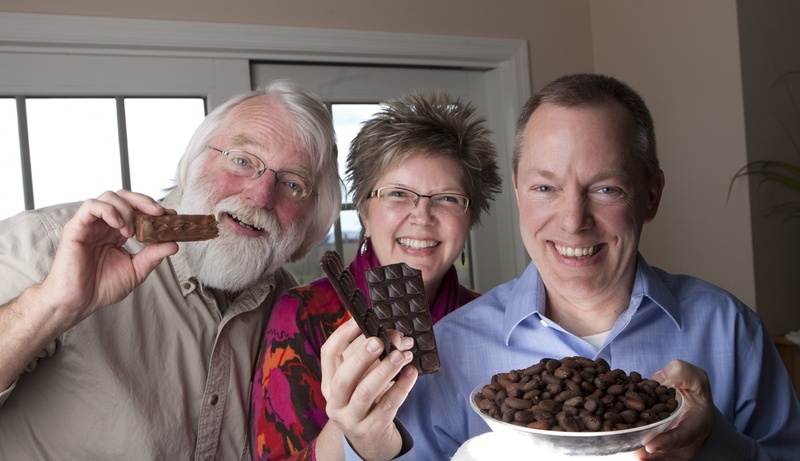 Also amazing: John Kaiser (MS ’87 chemical engineering) of nearby Manheim, Pa., is a senior process manager for cocoa and chocolate at Mars and he TASTES CHOCOLATE FOR A LIVING. Well, he does a lot more than just that, but still, John has one of the greatest jobs in the world. When we arrived at his home, he not only had stacks of Dove chocolate bars to send home with us, he also had pans of wonderfully fragrant roasted cocoa beans and old-fashioned hot chocolate for us to taste and photograph. This was not one of our toughest assignments. In keeping with the theme, our next visit was to Sandy Carosella (’88 industrial engineering), who greeted us with steaming cups of coffee and a big plate of whoopie pies. 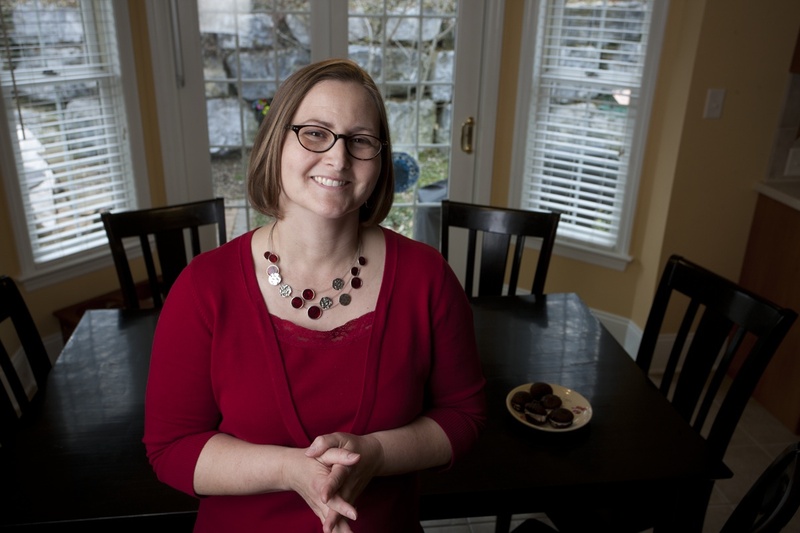 Sandy started her career as an engineer with Quaker Oats, but she shifted careers to teaching when her first child was born. She’s now a substitute teacher and focuses most of her energy on her family. Our next stop was tiny Delaware, the nation’s second-smallest state but home to a healthy number of Iowa State alumni: 236 at last count. Delaware’s historic claim to fame is that it was the first state to ratify the Constitution of the United States, technically making it THE first state. 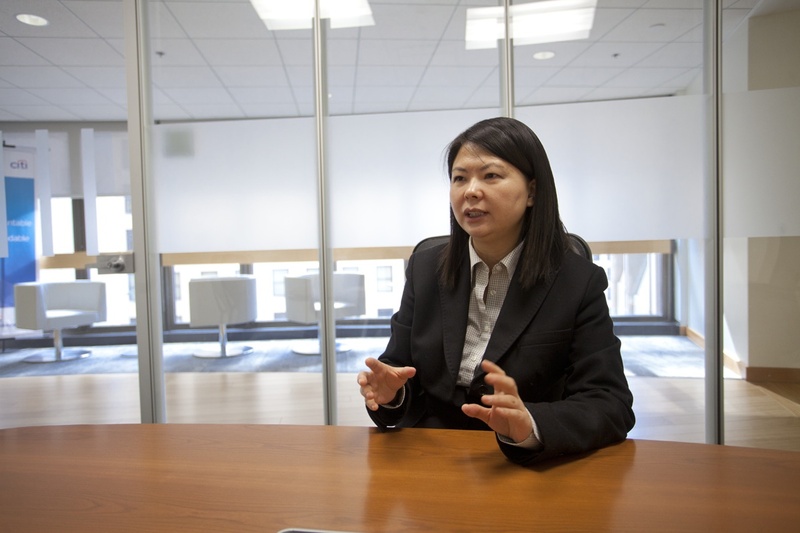 We spent a full day in Wilmington, meeting first in the snow-flurried downtown area with Fangqui Sun (MS ’97 economics and statistics), senior vice president of risk management for Citigroup. Fangqui, a native of northeastern China, told us wonderful stories about being warmly welcomed to the United States – and Ames, Iowa – to expand her education and launch a successful career in finance. I can’t wait to write her story! Our afternoon was spent on the Christina River. Well, Jim spent his afternoon on the river; I hung out on solid ground near the boathouse. 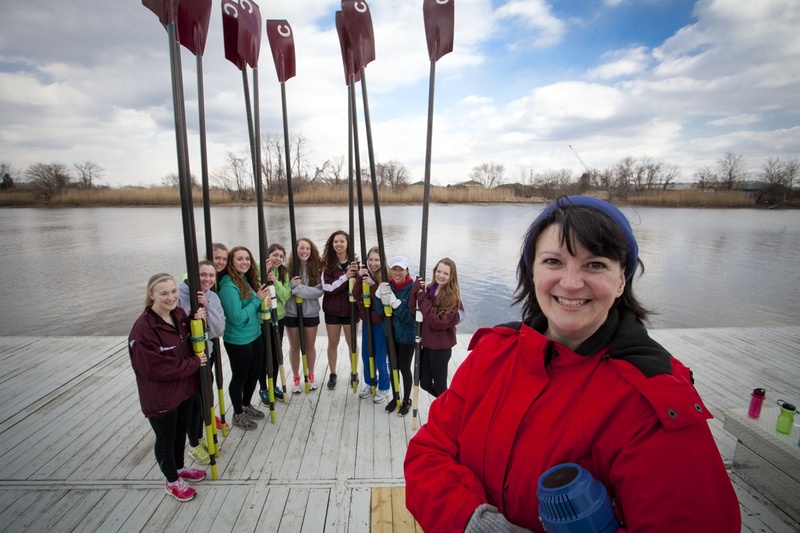 Jim was photographing alumna Marie Peters (’81 industrial administration), a math teacher and faculty adviser to the crew team at Concord High School. It was not an especially warm day to be outside, on or off the river, but Marie said the crew team had been on the water regularly since February. Brrrrrrr! Marie has led the crew program – the first in a public Delaware high school – for more than 10 years. Leaving Delaware, we moved on to Maryland. Our first meeting (in Silver Spring, just inside the D.C. beltway) was an absolute joy. Michelle DeFayette (’87 political science) had Jim and me laughing the entire time. Michelle has worked in training and development for Youth for Understanding International Exchange, the Peace Corps, and USAID – and she’s also played soccer since she was eight years old. And she’s just a fun person. 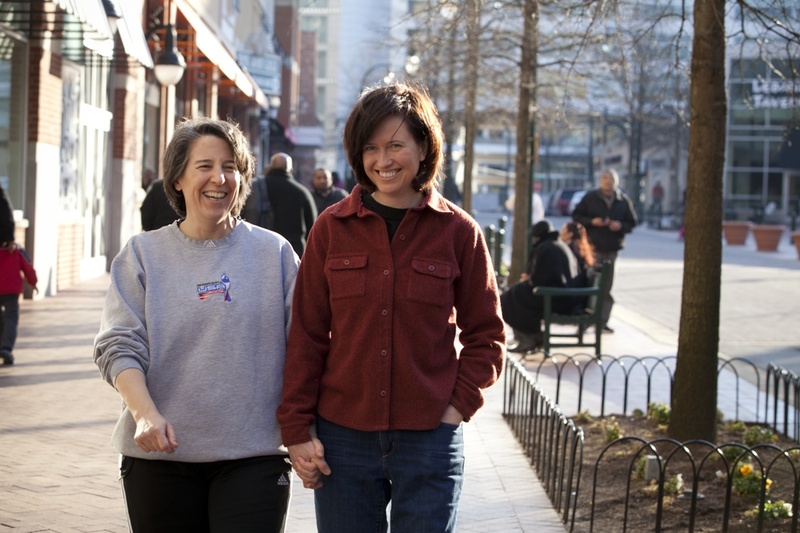 (That’s Michelle, far left, in downtown Silver Spring with partner Shannon England. )We had a blast spending the afternoon with her – we would have stayed much longer, but the D.C. traffic freaks us out, so we wanted to get to our overnight location before it got too late. Our next morning (a Sunday) was blissfully unscheduled. We drove into D.C. and took a walk around some of the monuments: the Franklin Delano Roosevelt Memorial, Jefferson Memorial, Martin Luther King Jr. National Memorial. All around us were disappointed tour-bus visitors, clearly in D.C. for the cherry blossoms but greeted only with sharp wind and a gray sky. We spent the afternoon in Annapolis – a quintessential American city. The combination of historic architecture (including the Maryland State House), U.S. Naval Academy, and the Chesapeake Bay makes Annapolis a wonderful place to visit. 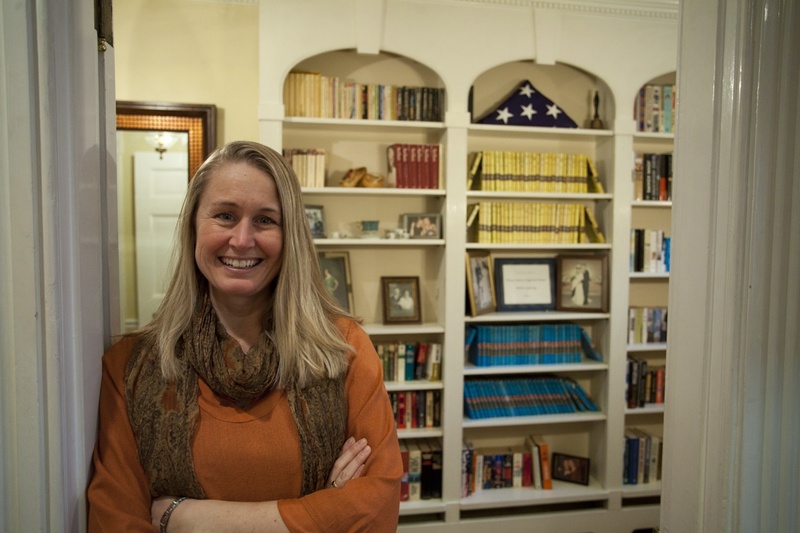 Annapolis is also the home of Bobbi Doorenbos (’92 finance), a former U.S. Air Force F-16 pilot. Bobbi currently works at Air National Guard headquarters at Andrews Air Force Base. She and Jim bonded over their shared Dutch heritage! The next morning – the start of the work week – we awoke to snow on the ground, snow covering the trees, snow still coming down, and the anticipation of a day of driving in and out of the city in what we could only assume would be weather-fueled gridlock. We were pleasantly surprised, because Monday’s traffic was far lighter than any other day. Did people stay home? Did they take public transportation? We don’t know, and we don’t care – we were just very happy that we were able to make it to all three of our appointments without incident. 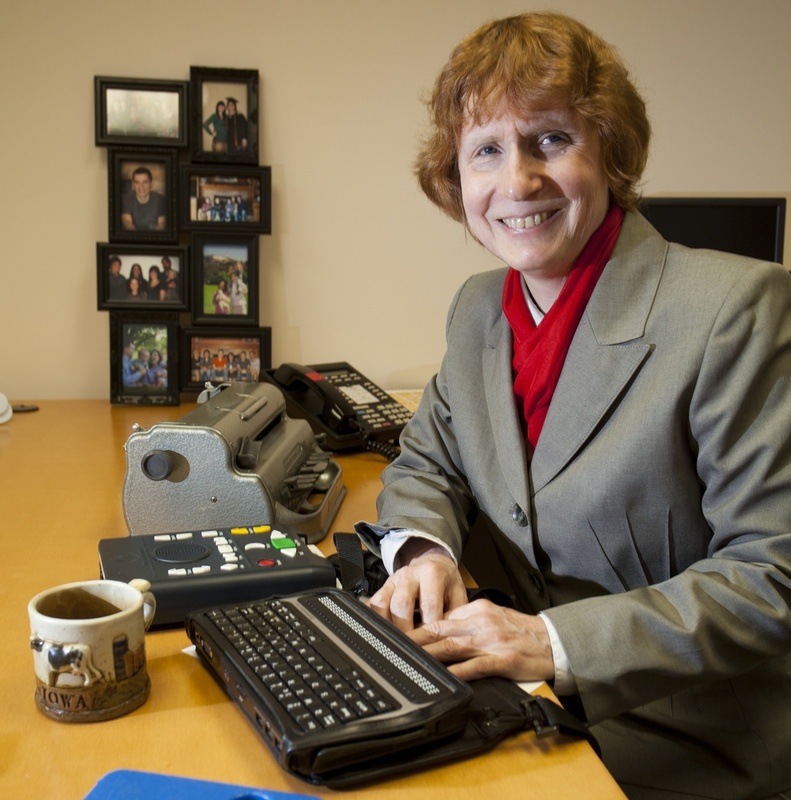 Our first photo/interview was on the north side of Washington, D.C., We met with Karen Keninger (MA ’92 English), director of the National Library Service for the Blind and Physically Handicapped – part of the Library of Congress. She showed us the incredible services provided to patrons all across the country – services she herself has used since she was young. I will tell you more about Karen in an upcoming blog. From there, we headed west to Leesburg, Va., where we met with one of our most esteemed alumni, Dwight Ink (’47 government). Mr. 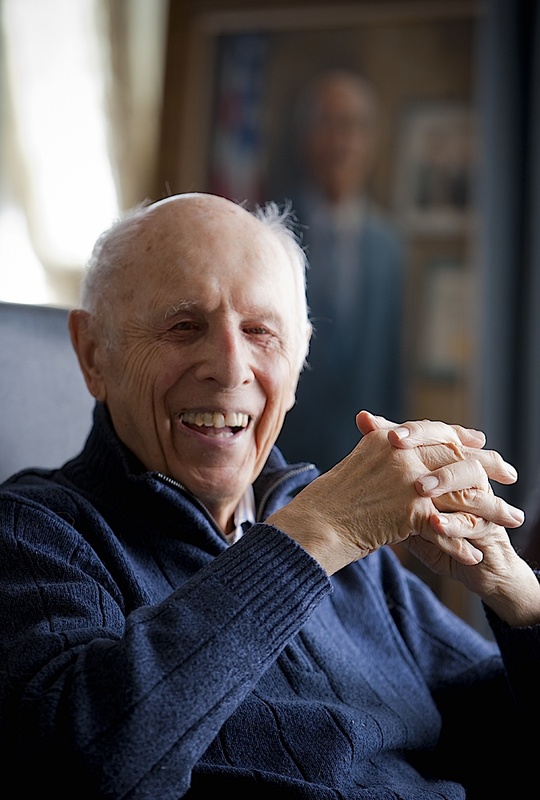 Ink (I can’t bring myself to call him Dwight) has literally made history as a public servant for the federal government; he worked with seven U.S. presidents, from Eisenhower to Reagan. He has so many stories to tell – I’m sure we only heard a small fraction of them. I’ll tell you some of those stories soon in a two-part blog. Our last meeting of the day (and of this trip) was with Rohini Ramnath (’07 international studies/Spanish/political science) back in D.C. Rohini moved to Washington, D.C., with Teach for America but has stayed in the city to work as a data manager for CentroNia’s DC Bilingual Public Charter School. I’ve been following Rohini’s career ever since she was a student at Iowa State – she was a Wallace E. Barron All-University Senior and in the first class of STATEment Makers – so it was really fun to catch up with her on her own turf. 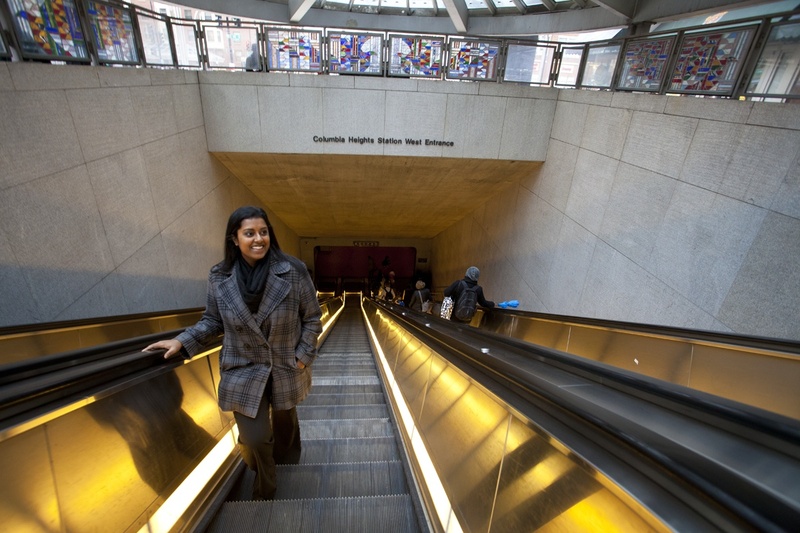 That’s Rohini below in the Columbia Heights metro station near her school. I’ll be spending the next few weeks writing profiles of each of these alumni (some of which will be posted here), going through Jim’s photos, and planning the next trip (to New York, New Jersey, and Connecticut), which is coming up way too fast…. But we now have 31 states completed! Categories Delaware, Maryland, Pennsylvania, Virginia, Washington, D.C.